Luton boss Nathan Jones admitted he had raised concerns over the playing surface at Colchester United before yesterday's 2-1 defeat. 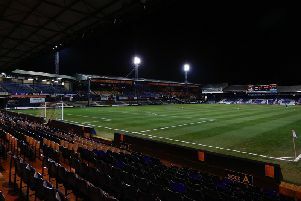 The Hatters chief, who saw midfielder Luke Berry suffer a serious dislocated ankle in the early stages when he got his studs caught in the turf, had no issue with the game going ahead, despite some standing water on some parts of the pitch, but when asked on what his issues were, he said: “What it was was there was huge holes in the pitch from where they verti drained it, and we weren’t happy with that before the game. “Now I can’t say that was any kind of contributory factor for the injury for example, we don’t know how he did it, there’s a few little things and I don’t want to say too much on them, but there was big holes in the pitch. “So that was the only thing that we weren’t really happy about. Giving an update on Berry’s injury after the game, Jones continued: “He’s been transferred to Ipswich, it’s a really tough one for him as he’s such a good kid as well. United chief John McGreal was also quick offer his sympathy to Berry as well, telling the Daily Gazette: “We wish Luke Berry well – you could see it was bad from the reaction of both their players and ours. "It's bitterly disappointing for him because he's been performing to a high standard for them. "You don't like to see fellow professionals go down with an injury like that so we're hoping that he's OK."